When you are redecorating your home, you may not think of using olive green as a good accent colour but it looks like this will be one of the trendiest shades for the next few years at least. It can be used for all sorts of decor as it is so versatile that you don’t have to be afraid that it overpowers your style. Here are a few ways to make sure you use it stylishly. A great and simple way to add some of this trendy colour in your home would be to use it in the curtains, which can easily e changed when you feel like you want something different. Paired with some neutral grey tones and matching olive green headboard and throw pillows, this bedroom looks cosy and comfy. This pale olive green looks like a great choice for dining chairs and paired with the wooden dining table, it really warms up the room. It works well with almost any colour and the subtle tones really make it look chic. If you’re afraid that going all olive green on your walls may be a little bit too much then we suggest that you should add a feature wall in olive green instead which can be the focal point of the room. Keep the rest of the room in neutra colours for an easy match. Wallpapers are an easy way to jazz up your home and this one in a pattern of sage and olive green works wonders. It looks fun, cool and matches well with any style you have. For a much easier way to incorporate this colour in your home if you are afraid of committing too much to this colour, you can add some pretty accents instead. The ottoman, pillows and a funky bust in olive green make all the difference from plain to exciting. Sometimes the focus can be on your floor too and this olive green rug in the dining room is a stylish way to use this colour. 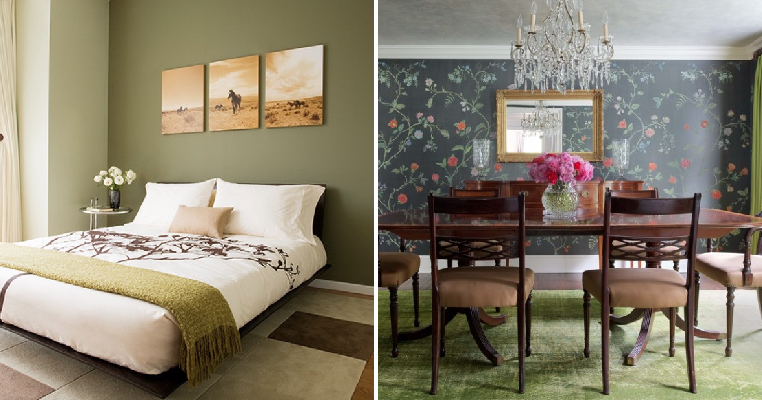 The olive green rug matches well with the coordinating curtains to make the room look more lively.